Discover Pain-Free Root Canals in Huntsville Today! If you have a severely damaged or decayed tooth, your dentist can save it from an extraction with root canal therapy. By removing its pulp, the tooth’s health is restored to allow it to stay in place. Although you know it can save your smile, you have significant fear and anxieties when visiting your dentist. You do not need to worry. You can enjoy stress-free root canals in Huntsville. Dental related-fears are more common than you might think. In fact, at least 15% of Americans suffer from some degree of fear or anxiety when it is time to visit their dentist. Often, it originates from the fear of the unknown or needing a potentially painful procedure, like a root canal. The American Association of Endodontists reports that 67% of Americans say fear of pain is their largest concern about the root canals. Although they have a bad reputation for being painful, several advancements in dentistry over the years now make them no worse than a traditional filling. In addition to new methods, your endodontist in Huntsville can also provide certain comfort amenities to help you relax during your procedure. 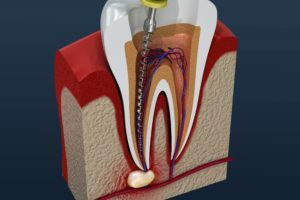 While root canals are often a center of controversy over their long-term viability, they are over 95% successful when used to rehabilitate a tooth. During the procedure, the areas of damage and your pulp are removed. Your tooth is then sterilized and sealed using a special material called gutta-percha. To protect it from future damage and to improve its function and appearance, a custom-made dental crown is placed over it. Prior to your treatment, your endodontist will work to ensure you feel comfortable and relaxed so you can head into your procedure with confidence. A local anesthetic is used to help numb the area. In some cases, a mild sedative is used to help keep your anxieties under control. To promote a pain-free treatment, a nonsurgical approach is taken. Microscopes allow your endodontist to view even the tiniest of inner structures to help navigate the branches and pathways. With a heightened level of visibility, it provides greater accuracy and precision to reduce any room for error that could lead to unexpected pain. After your treatment is complete, it is normal to experience some slight tenderness and discomfort for a couple of days; however, it can be managed easily using over-the-counter pain relievers. In no time at all, you can chew your favorite foods again and smile with confidence. Do not let the fear of a root canal prevent you from saving your tooth. You can enjoy a stress-free procedure with your endodontist. Dr. Deborah Bishop is a dedicated endodontist who strives to deliver high-quality dental care. Besides providing advanced services to help you maintain a healthy smile, she also keeps your comfort a top priority. She works with those who have dental fears to help them get the care they need. If you need a root canal, do not wait. Contact our office today to schedule a consultation.